Available in 19" seat width. 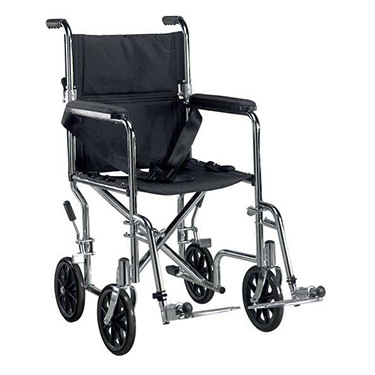 Carbon steel frame with double coated chrome provides an attractive, chip-proof, easy to maintain finish. Comes with carry pocket on back rest. Back folds down for easy storage and transport. This is a wonderful chair built narrowly to get through tight spaces! comfortable and easy to fold up. Pros:Goes through tight spaces with ease. comfortable. washable. easy to navigate. easy to set up. Cons:The brakes are in an awkward space and are not readily available but they do work well.